The Impatient Crafter : The Impatient Crafter™ Free Holiday Craft Project! The Impatient Crafter™ Free Holiday Craft Project! 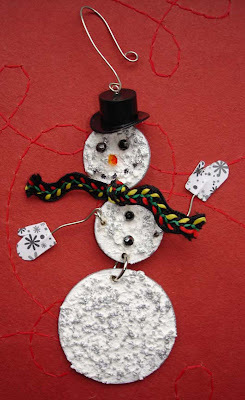 Here's a free holiday craft project I've created for your enjoyment. As always, these designs are intended for personal use and not for resale. It's hard to see the sparkle, but there's a light dusting of fine glitter on the surface of this design that gives it the perfect touch of magic. This is designed as an ornament, but I'd seriously sport it as a pendant. I'm kooky like that. So I've dubbed it an "ornapendant." Enjoy! Stop back on Thursday for the debut of the new The Impatient Crafter™ Crafty Quickies™ how-to video shorts, we're going to be making these for a while to get everyone squared away on the basics. Until then...craft on with your bad selves! 1. Use a spatula or your fingertips to spread a thick layer of Snow-Tex on each chipboard circle. Sprinkle a small amount of fine glass glitter on surface. Allow to dry overnight. 2. Use paint brush and shimmering silver paint to edge each circle and to paint the back of each circle. Use a foam applicator or your fingertip to lightly spread a small amount of silver paint across the raised portions of the surface of each circle. Allow to dry. 3. Mark hole placement and then use a drill with a 1/6” bit to create a hole in the top of the largest circle and the top, sides and bottom of one smaller circle and the top and bottom of the second smaller circle. Use a white pen to fix any areas that may have lost their snow. 4. Make gentle indentations with a small paintbrush end for eyes and nose on head circle. Glue them in place using Amazing Gloop. Allow to dry. While drying use Sharpee to add small dots for mouth. 5. Repeat process for buttons on mid-section circle. 6. Use wire to make small stick style arms. Bend with fingers to give sticks some movement. Use round nose pliers to create small loops in one end of each stick arm. 7. Drill hole in center top of top hat using 1/16” drill bit. Thread with an eye pin, bend eye pin flush to top of hat and cut to about 1/8”. Use round nose pliers to grasp and roll end into a loop. 8. Create a hook using 20 gauge Colourcraft wire in silver. Cut off a 3” section of wire. Use round nose pliers to make a small loop in each end. Bend center of wire over index finger and use fingers to shape wire into a hook. 9. Attach sections together using jump rings. 10. Attach arms using smaller jump rings. 11. Attach hat to top of top jump ring. 12. Attach hook to top of hat. 13. Tie a 3” section of ric-rac ribbon around front of jump ring that attaches head to body. Use fingers to fray edges slightly. 14. Trace a left and right mitten and cut out. Place each cut out mitten on back of paper to trace a mirror image mitten. Use EZ-Runner to apply double sided tape to back of one mitten in each set. Compress mittens over end of craft wire. Clean up any overlap with scissors. 15. Hang on tree or replace hook with a swivel lobster clasp and wear on a chain. Oh Snap (so to speak)! I'm very impressed with the little preview window that shows where each link is going to take me. Today's project is a great demonstration of why it pays to have all kinds of crafts supplies in the house. Mixing media like this makes a pro-looking product! Thanks for sharing this project Margot - I am amazed by your unceasing well of creativity! The snowmen are so cute!! Great idea!